Phillip I'm not going to ask you any questions because I'm tired of hearing your voice. Sorry if I ever seemed creepy. Permalink: Sorry if I ever seemed creepy. Phillip: What did you say to save me when they were trying to get rid of me? Boston Rob: It was a lot of work! I learned its ok to tell the world that I have a relationship with someone who's been dead since 1870. I can't believe it has taken 38 days to finally write your name down. I won't miss you, you're a nut case. I've never known anyone who can lay in bed day after day each day. I'd rather lose this game than lose a friend in Ashley. Permalink: I'd rather lose this game than lose a friend in Ashley. I didn't come out here to make friends and I did. Permalink: I didn't come out here to make friends and I did. I can't wait to spend the day tomorrow with Rob and Ashley, Phillip-free. 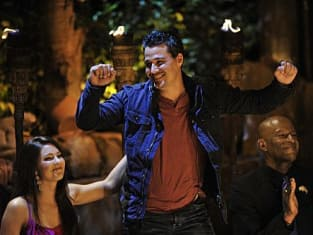 Ten years, 4 times on Survivor, 116 days, one challenge for one million bucks. I can still dictate this vote, I don't even need the idol. Permalink: I can still dictate this vote, I don't even need the idol. I've played this game four times. Do these guys not realize that? I can pretty much predict what these guys are going to do and say before they do it.